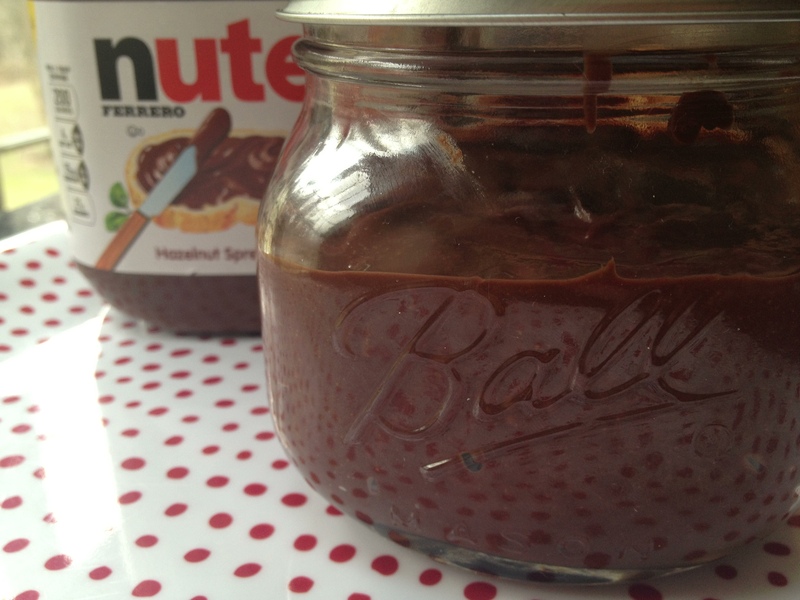 I don’t recall what initially inspired me to make my own Nutella, but I’m guessing it was a combination of PMS and something I may have seen in Bon Appetit. However, once I finally looked up the Bon Appetit recipe online, I saw the reviews were pretty terrible, as were the reviews from The Splendid Table recipe. Resolute, I startled googling like a madwoman, bookmarking dozens of recipes and reviews until my head was spinning. I did not buy these hazelnuts in vain, dammit! I knew I didn’t want additional sugar or heavy cream or powdered milk in my Nutella, three ingredients which appeared frequently. I wanted to make sure it stayed smooth and spreadable and didn’t harden into a lump, but I also wanted to make sure it wasn’t overly goopy. Most of all, I wanted it to taste as good or better than the original Nutella. Pulling from many different recipes, I came up with something which made sense to me as far as flavor and texture. I conducted a blind taste taste on my three guinea pigs children, and they all agreed that my Nutella was far superior. Sure, they know who butters their bread, but they are also a pretty truthful bunch when it comes to important matters of dessert. Warning! Warning! Warning! Make this at your own risk. If you need to be in a bathing suit or a wedding gown in thirty days or less, stay away from this recipe. Preheat oven to 350 degrees. On a rimmed baking sheet, toast the hazelnuts for about 14 minutes, shaking sheet occasionally. Cool and remove any stray skin. In a Vitamix or other heavy duty blender, grind the hazelnuts into a fine powder. Add salt, peanut oil, vanilla, cocoa powder and honey. Mix in blender on highest speed until smooth. In a double boiler, slowly melt the chocolate chips. Remove from heat and stir in the butter pieces until melted. Cool slightly and add to blender. Blend until completely smooth. Store in a glass jar, room temperature, for up to two weeks. This does harden up a bit after 24 hours, but 15 to 30 seconds on high in the microwave (lid removed) brings it back to an easily spreadable consistency. Just be sure to store this in a glass container. 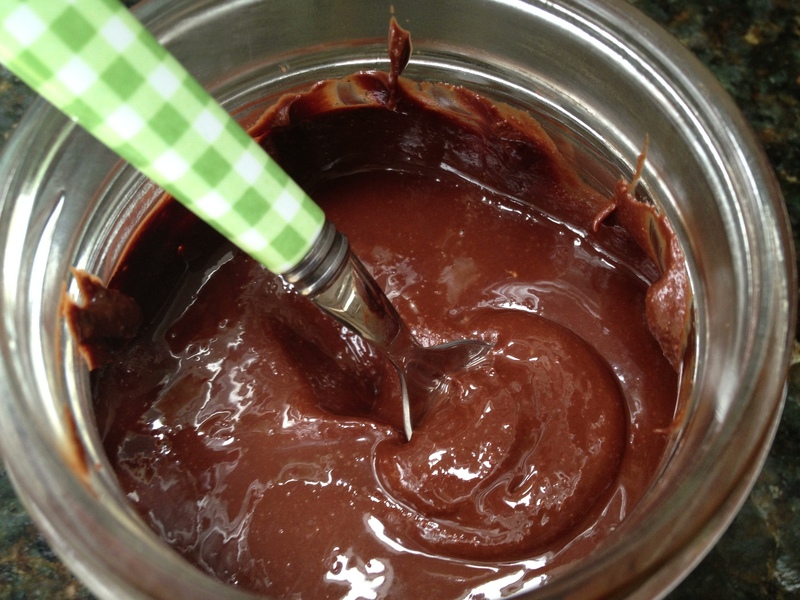 This entry was posted in Desserts and tagged homemade Nutella, Nutella recipe, Vitamix Nutella by Mom Mom's Apron. Bookmark the permalink. Dawn, I bought a jar of Nutella and promptly returned it after I saw the calorie count. Lauren loves it, and I thought I would try, but NO, NO, NO! However, great for your kids. Love how you try to invent your own. Sign of a wonderful culinary achiever.